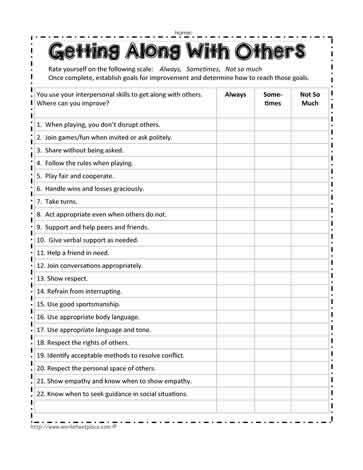 Here are the skills you need to be able to get along with others. You use your interpersonal skills to get along with others. Where can you improve? 1. When playing, you don?t disrupt others. 2. Join games/fun when invited or ask politely. 3. Share without being asked. 4. Follow the rules when playing. 5. Play fair and cooperate. 6. Handle wins and losses graciously. 8. Act appropriate even when others do not. 9. Support and help peers and friends. 10. Give verbal support as needed. 11. Help a friend in need. 16. Use appropriate body language. 17. Use appropriate language and tone. 18. Respect the rights of others. 19. Identify acceptable methods to resolve conflict. 20. Respect the personal space of others. 21. Show empathy and know when to show empathy. 22. Know when to seek guidance in social situations.